Israeli troops and Jewish settlers on Friday attacked a Palestinian school near the West Bank city of Bethlehem, firing live ammunition at students, teachers and Education Ministry officials, according to a Palestinian official. "Soldiers and settlers surrounded the school in the village of Beit Tamar before opening fire with live ammunition and teargas," Sami Marwa, a Palestinian Education Ministry official, told Anadolu Agency. "The mere presence of the soldiers and settlers terrified the children, who began crying and running all over the place," he said. Palestinian Education Minister Sabri Saidam, for his part, was quick to condemn the incident. "Words can't describe what happened today in Beit Tamar," he said. "The day began with children at play and ended with teargas and terror." Also on Friday, the Israeli army arrested an eight-year-old Palestinian boy in the occupied West Bank city of Hebron (Al-Khalil), according to a Palestinian activist. Mohamed Awad, an anti-settlement activist, told Anadolu Agency that an Israeli military force had arrested the child, Omar Abu Ayyash, in Hebron's Beit Ummar district. 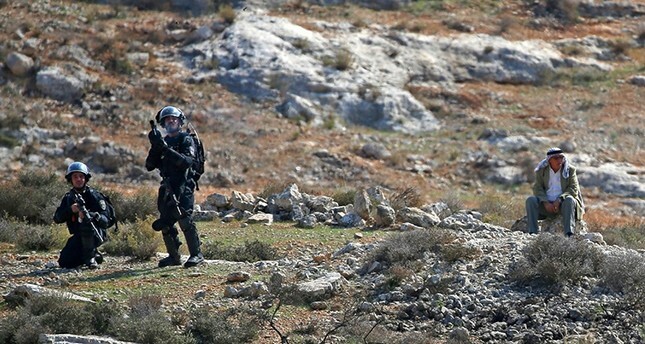 According to the army, the eight-year-old was arrested for throwing stones at Israeli troops deployed in the city. In a related development, a Palestinian ambulance driver was hurt when Israeli troops opened fire on a Palestinian ambulance -- with rubber bullets -- in the town of Ras Karkar west of Ramallah. According to the Palestinian Red Crescent (PRC), the driver was injured by fragments of broken glass. More than 650,000 Israeli settlers currently live on 196 Jewish-only settlements (built with the Israeli government's approval) and more than 200 settler "outposts" (built without its approval) across the occupied West Bank, according to Palestinian figures.